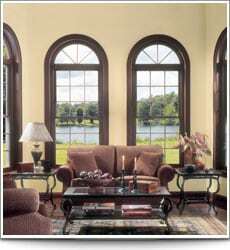 Soft-Lite Windows in Randolph NJ - New Jersey Siding & Windows, Inc.
Soft-Lite Windows have been manufacturing high-quality products since 1934, and during the eight decades, many things in our world have changed. 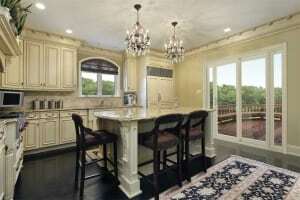 One of the most dramatic changes has been the advancement in window design and manufacturing. New Jersey Siding and Windows is proud to offer these high-quality, high-efficient / technically superior windows to homeowners. With the continually rising cost of energy becoming a major national concern, it’s important for window and door manufacturers to utilize technological advancements to develop the most energy efficient and durable products available. Soft-Lite’s commitment to energy efficiency traces back to its beginning. With Soft-Lite’s philosophy, decades of experience, state-of- the-art manufacturing plant, and the improved materials of today, the stage was set for Soft-Lite to create windows unlike any other in the industry. When combined with New Jersey Siding and Window’s 22-year history of quality installations, a Soft-Lite window installation will add to the functionality and value of your home. There are many different window styles. Choosing the right window for your home is important because it addresses both aesthetics and function. Double-hung windows tilt in for easy cleaning. While similar to single-hung windows, they differ in that both the top and bottom sash are operable. Slider windows may be a good choice for walls where the space is wider than it is tall. These types of windows do a great job of bringing the landscape into a home. Casement and awning windows open out into the exterior of the home. If ventilation is a consideration in your space, a casement or awning window could be the best choice. All above options are easy to clean from inside your home. Double-hung windows are the most popular style manufactured by Soft-Lite ‒ and, in fact, are the most-used window throughout the country. A double-hung is the classic residential window, composed of a set of vertical sashes that both slide up and down. What is immediately apparent about a Soft-Lite double-hung window is its stylish beauty. What might not be so easy to see – until you get your next power bill – is how energy efficient Soft-Lite double-hung windows are. In fact, Soft-Lite’s double-hung designs are the most energy efficient in the industry, as well as the highest-performing. 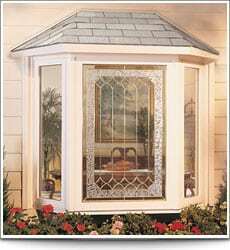 Soft-Lite carries high-quality bow and bay windows, the Elements, Classic, and Bainbridge collections. Whether you add a bow or bay window, your room will feel much more welcoming and spacious by adding three-dimensional depth and light. Let your imagination run free with bay windows from Soft-Lite, which are customizable with countless combinations of window styles, colors, and energy-efficient glass options. A bay window actually is a set of windows arranged together in a pattern that extends outward from the home. The pattern includes three panels, like a triptych in a Renaissance cathedral. How those three panels are composed is completely up to you, and that’s where your imagination comes into play. You can design your bay windows any way you like to match your home. For example, combine a picture window in the center with two casement windows on either side for ventilation. Go with a shingled gable effect on the outside, or add a sweeping metal roofing finish instead. Use custom-designed decorative glass, or any number of different grid patterns to create the effect you desire. No other windows can change the look and feel of a room like the Bay or Bow window. These windows also come with a SuperSeat™ insulated seat board providing increased energy efficiency. 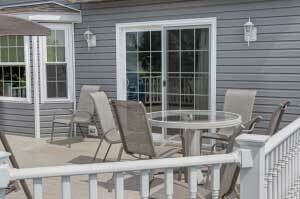 Soft-Lite offers a variety of specialty windows in shape, color and design for patios and other locations. These windows offer perfect form and function in a specialty window, and the Garden Vue Window offers beautiful outdoor views with clean lines and lasting durability. A casement window has a hinged sash that swings in or out like a door. Crank-style or lever-style handles are used to open the sash. An additional handle locks the sash in the closed position. The handle mechanism of a casement window is easy to operate and is usually located low on the window, making the casement window an ideal window to place above cabinets, counter tops, or places that are slightly more difficult to reach. Casements are appealing both in new contemporary homes and in older style Prairie and Tudor homes. Like other styles of windows, the casement window can be installed as a single unit, or grouped together. Awning windows tilt open at the bottom, making them convenient to use even on rainy days. They are easy to open, easy to clean and maintain, and provide excellent ventilation. 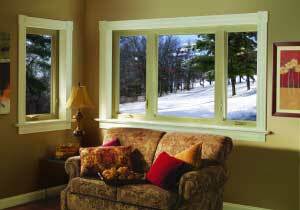 Awning windows work best in openings that are small and wide. Think of the sliding window as a double-hung turned on its side! It combines all the features of a double-hung window, without the need for a balancer, so they’re very easy to open and close. Our full line of versatile sliders are available in a variety of window styles and operating choices. For instance, if you’re looking for a wider window, you have the option to choose between 2-lite and 3-lite sliders. All of our slider sashes roll easily on corrosion-resistant brass rollers. winter, but release it in the summer. 30° roof slope for efficient water shedding. Specially built trapezoidal operating side casements that open wide for ventilation. Dual compression seals and locking hardware provide air and water tightness. Weep channels keep the interior dry. 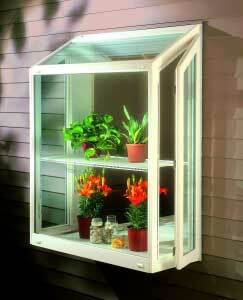 Adjustable height PVC-coated shelves or optional glass shelves. Seatboard is resistant to mold, mildew, fading, discoloration, warping, peeling and delamination.